George Zimmerman’s friend and fellow neighborhood watch partner, Frank Taaffe is a 56 year old New Yorker from the Bronx. He is now living in Florida and it is his home at, “The Retreat At Twin Lakes” which was located next to the short cut that all the neighborhood kids used to exit the development to travel to the local 7eleven. Also, it was his home in which a robbery supposedly was thwarted earlier that month of February, 2012 by a young Black man. ( I could not find any record of this reporting as per Florida public records.) The Florida public records do definitely indicate that the appropriate Black suspects were apprehended and charged regarding the burglary on 2/6/2012 at 1540 Retreat View Circle. He has been seen frequently on HLN and FOX TV various talk shows vehemently defending his friend George Zimmerman. He exhibited the habit of going off on tangents as to how Mr. Zimmerman was known for going out of his way to help his neighbors and then he would lament about the lack of a responsible Father figure in the Black family. One discomforting issue with Frank Taaffe representing his friend in the media is that eventually peoples will become aware of his questionable background and the association between the both will eventually not be positive. 2/11/1983: Dissolution of Marriage filed by Francis B Taaffe’s wife, Gisele J. Taaffe. Domestic violence cited as one of the reasons. 04/26/1997: State of Florida vs. Frank Taaffe. Misdemeanor Battery in the First Degree. Victim is Susan Brown Taaffe. 04/01/1999: Dissolution of Marriage was filed by Susan Brown Taaffe. Domestic violence cited as one of the reasons. Led to irreconcilable differences. 03/11/2000: Misdemeanor Criminal Petty Theft. It’s noted he broke into ex-wife Susan’s house & stole some items. 03/22/2000: Domestic Violence complaint filed by Susan Brown Taaffe. Still being attacked by Frank Taaffe despite divorce. 08/30/2000: Criminal Felony; First Degree – Misdemeanor Trespass & Second Degree -Criminal Petty Theft. 04/22/2000: Domestic Violence complaint filed by minors Meredith and William Taaffe and their mom Susan Brown Taaffe. It appears Frank Taaffe is now terrorizing the daughter and son they are issued a temporary restraining order. 01/28/2004: Civil Traffic Infractions. Appears to be toll related. 03/23/2004: Auto Negligence. Appears to be reckless driving complaint. 06/04/2008: Repeated Violence complaint filed by Andrew Joseph Amon. Phone calls, text messages and emails submitted into evidence. 07/27/2012: DUI arrest after a bartender called police, saying that Taaffe just left the Lake Mary bar, gotten behind the wheel of his car and appeared to be a danger to society because it took him 5 min to figure out how to turn car on. He was pulled over a short time later. A pair of breath-alcohol tests put his alcohol level at 0.202 and 0.197, well above the state limit of 0.08. 11/07/2012: Frank Taaffe pleads “no contest” to a lesser charge of reckless driving related to alcohol use. He was placed on probation for six months and was ordered to do 25 hours of community service, get counseling and to attend Alcoholics Anonymous meetings regularly. 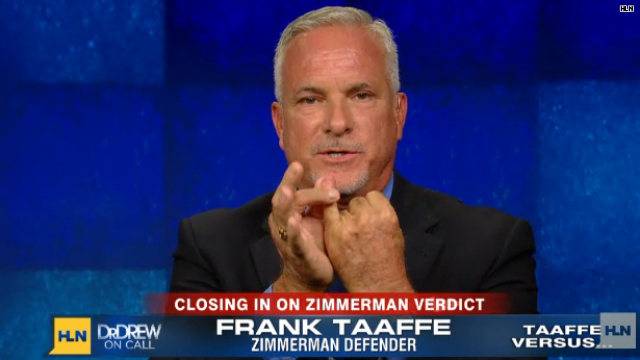 What is even more troubling than the above is Mr. Taaffe explaining to Greta Van Sustern in a FOX TV interview, that shortly before his arrest, George Zimmerman and Frank Taaffe met to discuss talking points. According to Frank Taaffe, Mr. Zimmerman shared a list of several talking points that he wanted Frank to promote including a discussion of the Black man who was responsible for the attempted robbery on Frank’s home being also involved with the two other burglaries, and in addition, he was a young Black male who lived in the community. Saturday, hours before the verdict was read, Mr. Frank Taaffe both on Fox TV and HLN TV that he was certain that the status of the jury was 5-1 in favor of George Zimmerman, and that there was one jurist holding out for the manslaughter charge. And then, of course, Nancy Grace probed him about how he could possibly have this information, and he responded that he was “absolutely certain” of the information he had. Nancy Grace obviously discounted him. Days afterwards, Juror 37 confirmed his analysis. The question I want to know is HOW DID HE HAVE THAT INFORMATION? As of November, 2013, it was Frank Taaffe who posted the $9000 bail for George Zimmerman’s latest arrest for domestic violence against his current ex girlfriend. George Zimmerman who filed a financial affidavit with the court claiming to be financially limited in funds by which he qualified for a public defender, has now hired a very competent, high profile, expensive attorney, Jayne Weintraub. I can’t help but wonder how is she being compensated? 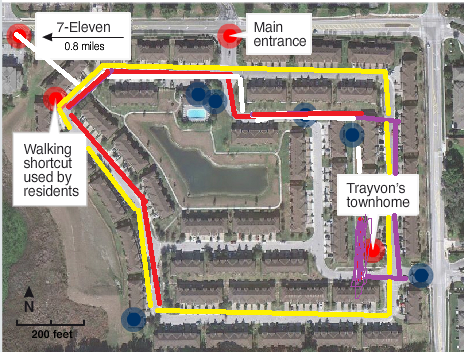 It is now my hypothesis that Trayvon Martin used the short cut located next to the home of Frank Taaffe just like all the other kids in the neighborhood. After all it was raining, and it would be logical for Trayvon to travel the shortest known route. 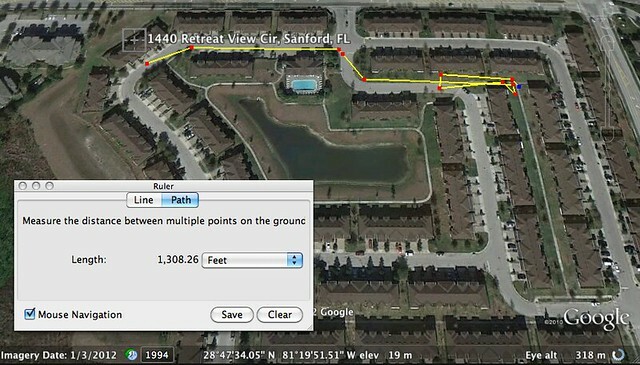 Also within the first 12 minutes of the first audio recording out of three between George Zimmerman and Sanford Police Investigator, D. Singleton ( found on axiomamnesia.com), he states that he first saw the suspect next to the neighbor’s home which had almost been robbed earlier that month, which is Frank Taaffe’s home. I am further speculating that it was Frank Taaffe who originally noticed Trayvon Martin walking past his home. Now, Frank Taaffe does suffer from racism and I’m surmising that it is he who somehow contacted George Zimmerman ( or they were already hanging out together) to discuss his concerns about a suspicious young Black teenager walking around his home. Remember that we now know Mrs. Zimmerman had already left the household after a major fight earlier that same week. The rest is history. It is my theory that George Zimmerman would not want to betray his friend by revealing this information and in return, Frank Taaffe has been loyal in helping Mr. Zimmerman with the media and maybe even financially. MARK OSTERMAN IS THE FEDERAL AIR MARSHAL FRIEND WHO HELPED GEORGE AND HIS WIFE, SHELLIE with shelter for about 6 weeks after the shooting. Mr. Zimmerman and Mrs. Zimmerman were fearful for their well being as they were receiving death threats. Consequently, Mr. Mark Osterman and his wife, Sondra took them in as guests in their Lake Mary residence. Mr. Osterman has written a book titled “Defending Our Friend: The Most Hated Man in America,” which defends Zimmerman’s life surrounding the Feb. 26 shooting in Sanford. He also depicts his admiration of the Sanford Police Chief, Bill Lee, and describes his feelings towards his former police lieutenant as that of a “father figure.” He was the one at the shooting scene on 2/26/2012, at the police station present at all the George Zimmerman interviews, at the video reeanactment on 2/27/2012 and interacting as a liason with the FBI and the FDLE on behalf of Mr. Zimmerman. It was Mr. Osterman who exposed to the FBI and the FDLE, George Zimmerman’s childhood history of being beaten frequently by his Mother while his Dad did little to protect him. Mr. Osterman added that George Zimmerman and his family had been estranged for years. According to the Miami Herald article, it seems that Mr. Zimmerman’s and Mark Osterman’s lives connected around 2006 when Mark’s wife and Mr. Zimmerman worked at the same mortgage brokerage business and while both were living in the Lake Mary area. Both Mr. Zimmerman and Mrs. Sondra Osterman lost their jobs when the real estate business went bust, and they both ended up working at a company Digital Risk, specializing in home lending fraudulent activities. Mrs. Sondra Osterman presided over the wedding between George and Shellie Zimmerman in 2007. It is not hard to envision how Mr. Zimmerman would look up to Mark Osterman, a Federal Air Marshal who knew how to take care of himself. He was the friend who recommended that Mr. Zimmerman use the Kel Tec PF9 gun as he and his wife, Shellie were having issues with a pit bull who was not always restrained. He was the friend who took George Zimmerman to the shooting range and taught him the safety rules and how to shoot on a monthly basis. However, while I admire Mr. Osterman’s loyalty to Mr. Zimmerman, I also see something else that I do not admire, the lack of a moral compass and appropriate boundaries. According to a Miami Herald article dated July 13, 2012, Mr. Osterman is a college graduate of Daytona Beach Community college in 1992 and eventually came to work for the Sanford Police Department. In 1998, when he was a deputy, he and another officer became involved with a con artist, JUAN DIAZ. This con artist told the two officers that he was a New York Yankee baseball player and that he needed to hire bodyguards. Mr. Osterman did not inform his superiors of this extra assignment as specifically required and he, and his fellow officer accompanied this con artist to many locations, including strip joints, while this con artist drove an expensive sports car and flashed lots of monies. The con artist was finally arrested for writing a phony check for $38,000 to a dealership for a Ford Expedition. The Orlando Sentinel reports that when the officers figured out the check for the Ford was worthless, instead of reporting the car stolen, they hit the dealer up for a friend to get a finder’s fee for the vehicle’s return. When Mr. Osterman and his fellow officer were questioned about this extra-curricular job and activities by their superiors, they continued to fabricate a story..lie, and they were fired. Both filed an appeal and in the process of the appeal, they resigned. Mr. Osterman’s backround does include military time in the army, time as a SCHOOL RESOURCE OFFICER, and after he resigned from the Sanford Police Department, he was part of the Volusia County Beach Patrol. Mr. Osterman’s Facebook profile says he has worked for the Department of Homeland Security since 2001. On Facebook, Mr. Osterman describes his job as “lots of shooting and traveling.” Air marshals travel incognito, ready to act when flights are hijacked. Six weeks after the Feb. 26 killing, Mr. Zimmerman was charged with second-degree murder. On April 26, 2012 agents paid Mr. Osterman a visit. It is my theory that it was Mark Osterman whose influence is felt early in the investigation process. He is a former Sanford Deputy and he would have had some influence in depicting George Zimmerman as a decent man who was simply trying to protect his neighborhood from a recent string of robberies. He was also a former school resource officer, and so I wouldn’t be surprised if he was the one who orchestrated the release (leak) of Trayvon Martin’s school suspension records to Frances Robles of the Miami Herald just one month after the shooting of Trayvon Martin. I am also speculating that he was party to padding the October 2011 suspension form with the list of found jewelry with a tool. 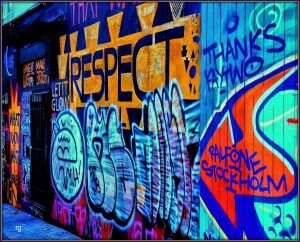 Trayvon Martin’s parents have vehemently denied ever being informed of anything beyond graffiti art on the October 2011 form. The school resource officer, Darryl Dunn is stating that this information was not originally shared with the juvenile police system because the Miami-Dade police chief’s goal was to show a decrease in crime statistics. The problem with this excuse is it would not have precluded him from sharing this crucial information with the parents. For example, in the February 2012 suspension, it is reported that Trayvon Martin had in his possession a bag with a residual amount of marijuana and a pipe. This information was not turned over to the juvenile police system even though it was an option but it was shared with the parents and Trayvon Martin received a suspension. Then the reporter Frances Robles of the Miami Herald was privy to this confidential file on Trayvon Martin that not even his parents had access to prior to the shooting. It seems that it was Mark Osterman’s job to paint Trayvon Martin as a thug, in other words, the kid had it coming. Hi. i really enjoyed your post yesterday and i even learned couple of things i didn’t know i didn’t know! 🙂 and that’s my goal everyday! thank you very much! i’m re-tweeting yesterdays page again since it was really late when i found it and i don’t want anyone to miss it. this may sound weird to say but i also appreciate you for posting your point of view as a white woman. of course i know plenty who do so regularly but i still wish more would come out with theirs, we ALL need to stand together against this kind of bigotry. and when white ppl do it i think it has a different effect on other white ppl who may be content with the status quo or who aren’t aware of the issue, or who may be under the false impression that this is just a black person’s problem. initially i was at a loss at how to discuss these issues with others. i thought it would be too uncomfortable and could alienate some of my family and friends. but i’ve come to realize the only ones who are uncomfortable are the racists. and if they aren’t willing to change then i personally don’t want to be around them, and sure don’t want my small, impressionable son to be anywhere near them! i’ve too been shocked at many white friends and even family members’ comments and thoughts/feelings on this case. i’ve basically cut off one of my aunts for something she said that was based on racism and ignorance. which bothered me on another level because she is so educated. i always though racism was for hicks and idiots. i didn’t realize there was still so much out there in the mainstream until i started researching this case. my god it’s just sick! i can’t stand it really. and i will make it my business to do whatever i can to cut it off at the knees! this is the one supposedly by Francis’ home? but i don’t trust some of the reports abt all the “crime” in that neighborhood after someone reported on the crimes from their FOIA request that showed the burglaries weren’t as serious as it sounds. for ex,a stolen bike is called a burglary, so is a missing plant in someone’s front yard, and there was copper wire stolen from empty houses that were part of the “crime wave” and we do know the single most serious crime was Trayvon’s murder. other than, the only other serious one was the lady the defense trotted out and used to play to the racial stereotypes of the jury. and i think there was something weird about that too. i have a feeling that that girl knew one or more of those guys who came in her house because at least one lived in the area. that story of them knocking on the door was odd..anyway i’m going to ask someone about this one by francis’ house because i can’t remember the details… i’m just not recalling…. Thank you for your comments and for your support. I am sure the burglary reports are overblown. In my mind, I am thinking it is important that the home GZ is referring to be that of Frank Taaffe. I agree, we all need to do our part to call out racism when we hear it and not ignore it because it is uncomfortable or it might hurt someone’s feelings. I have been thinking about your comments. This issue of racism is so insiduous. It is now the holidays and I had a situation which I still feel angry about because I did’t feel comfortable dealing with it in real time. Last year, after work, I and my very good Black friend whom I admire tremendously decided to go together to a local church for a Christmas eve service. There was a very nice looking couple greeting and welcoming folks at the door. They shook my hands and they shook the hands of the folks behind me but they did not shake my friend’s hands. I was so furious. It took me forever to write a letter to the Pastor and of course, I will not be attending any church services at this church. Incidentally, these are the type of slights my Black brothers and sisters live with on a regular basis. I am still writing to Shannon. I did have a talk with my friend afterwards about this situation. Fortunately, with her being a New Yorker she opened up about it first. I am grateful for my friend because if I ever say or do anything insensitive, she will squash me like a bug. For my Black brothers and sisters, please do this also. People who care about you will appreciate the feedback. I still recall another situation from my past in which a Black brother confronted me. This was in the days …a long time ago when eye glasses were so ugly. I had been working in a research capacity for a Philadelphia Black attorney who treated me vey well. One day at work, he commented that he saw me while walking somewhere, and I acted like I didn’t know him. I had to confess that while away from work I hated to wear my ugly glasses and without them I am blind as a bat. I did mention he could have come up to me and I would have been thrilled to see him. The point is I appreciated him being open about his upsetment. Here is your link to all documents. You will find his map drawn for Det.Singletary and then redrawn once he realizes he could not have seen Trayvon from his indicated first mark. Thank you for all your dedication! Thanks, I do use axiomamnesia.com for a resource but for some reason in all their data on that site, I can’t find that first map that GZ and D. Singleton worked on together on 2/26/2012. This is more as a curiosity on my part. I would like to know what he marked down on a map before he had to much influence from other sources or too much time to think about what he was saying. Thanks again for your comments and support!! Somehow I keep seeing unapproved with my comment when I want to have approved. Here is link to jean dodge’s Flickr .click on top right to read detailed explanation. Your map you’ve been searching for is here. Thank you for the links. They are extremely helpful. Again thanks!!!!! Link to tchoupi.cailous’s blog. Quoted by bcc.list, Whonoze, as brilliant work. Hi again and thanks for your help and insights. My next question is: Has any one of the other bloggers seriously considered the possibility that GZ bloodied nose and damage to back of GZ head while his head was on sidewalk could be due to gun recoil which the Kel Tec PF9 is reputed to have? What if TM was simply trying to grab the gun away like he told Mark Osterman? 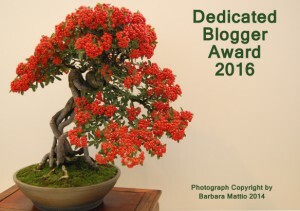 Oops, meant quoted and re-blogged by some of the best!! I appreciate your comments and support. It is great to hear from a fellow Floridian grandmom. Hi again, I’m afraid this case has become too much of an obsession. Besides taking time to read the different sites recommended by you and others, I’m not blogging on this case for awhile. I just emailed the DOJ when I realized, I’ve gone too far. Again, thank you for your comments, insights, help and support from a fellow Grandmom from Florida! This case represents so many issues over the typical “hot head kills someone,”which is all too frequent in our gun loving society. The fact that the police assumed it was a ” good kill” hurts anyone evolved enough to realize this should not be the mores of a 21st century world. But to then witness a state prosecutor,knowing the world is watching, throw a case raises the horror to a level rarely seen. I can’t advise you on whether or not you are correct in maintaining your sense of safety by stepping away, I will say it is a measure of your sense of justice and level of empathy to experience such heartbreaking pain. I am a clinical social worker, for me the deep feeling I still feel is what I am about. Better an obsession with an injustice than an obsession with status. This case struck a cord like no other, worldwide too! It was a white law student from Tennessee, Kevin Cunningham who started the Change.Org petition which garnered over 2.5 million signatures in one month. The record, I believe, to this day. Kevin turned it over to the Fultons when they asked him to. An entire Middle East movement, Arab spring, was started when a simple vegetable stall vendor set himself on fire and it was then shown around the world. I would make a guess, it is your children who are calling your intense concern with this injustice by the prejorative ” obsession” . Nothing gets changed without someone’s obsession and then lighting a candle in their little part of the world. Writing a letter to the DOJ as a representative of an unexpected population ( white and republican and grandmother) is not going too far but hopefully, will let them become aware it is not just the BGI folks who are deeply wounded. Stay Strong for Trayvon, dear fellow white grandmother. Thanks for helping me put this into perspective.You are right on the money! Whew!! Happy dance! And by the way, do you have any idea how many blogs are written and never receive even one comment? And you just started and look how people have taken the time to not only read it but type a response. This is very very rare. Did you notice that Mark O’Mara finally presented GZ with a bill for 2.5 million dollars? Besides any monies that he may receive directly from the State of Florida, I’m figuring that it is finally dawning on Mr. O’Mara that he may never see another dime. He may be slowly coming to terms as to who he has been dealing with for so many months. I bet he is questioning how the expensive attorney, Jayne Weintraub is being compensated as she will not take a high profile case, pro bono. She does not need this case to establish her bona fides. Tubs listing that 2.5 was probably just a ploy in advance of activating his fund, letting his supporters see how broke he was. The fact he threatened a pretty blonde female cancels out any hope for racists of both sexes leaving only men who have experienced the womanly wiles contingent. That is severely limiting for him, IMHO. Taffe built quite a high profile on tub’s back and so far hasn’t thrown him under the bus like Osterman did. I would guess tubs is staying with him as he has no contact with any in his family…..wait there is Gracie and Ken/Scott so maybe that’s where he laying low? Probably her as tubs is very much a coward with the typical attributes and Taffe is pretty terrifying. Stay with us..you are adding an important voice. The graft all over USA, now listening that pensions will be cut by Detroit,h is soly due to the wall st. Investment banks selling junk to pension funds….govt. paid 3 trillion dollars to keep retail banks from closing. What you are saying makes perfect sense because he had already listed being 2.5 million dollars in debt in his affidavit to qualify for a public defender along with $149 cash and no savings account. I just blogged last night that the public defender who was working with GZ was a 20 year veteran attorney, Mr. Dowdy who had previously been working for his brother, Robert Jr. in a media campaign to counter negative publicity. It was when this became public that GZ dropped the public defender and then hired the fancy attorney, Jayne Weintraub. Incidentally, I did write Dr. Drew of HLN TV about my views. I would not want him to claim ignorance.